I bought some early peaches this weekend and made one of my favorite treats: fresh peach pie. I grew up with this recipe and I don't know where my mom got it, but it is really easy and very yummy. I used a store bought graham cracker crust, but you could use a cooked homemade pie shell or do a homemade graham cracker crust as well. My husband was gone this weekend, so I opted for super easy since I had the kids. Mix sugar and cornstarch in a small saucepan. Add water and boil until clear and starting to thicken. Add jello powder and cool pan in an inch of ice cold water (I do this in my sink) until filling is room temperature. 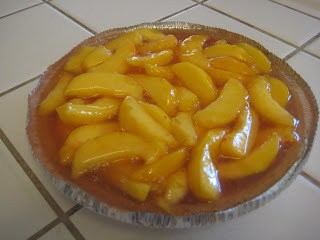 Mix filling with peach slices and pour into crust. Refrigerate until filling is firm. Serve with whipped cream or ice cream. For Abby S. and Tiffany C.